Our history is still very apparent and here for us to discover. There are exceptionally old remains of both religious orders and defensible positions, old burial tombs and standing stones marking places of worship or memorials to the even more distant past. 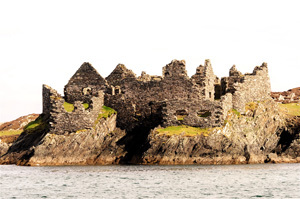 High Island, just a short journey out from our home port, is home to one of the ancient fifth century monasteries that housed much of Europe’s wealth of learning during the dark ages and beyond. There are remains of Viking settlements and forts along this Western shore such as Dun Na Hinne or Fort of the Fair on Inishbofin Island, many castles and towers, fortified manors and homes of the Celtic families, and barracks built for the subjugation of those people. In Connemara and Mayo The O’Malleys, and the O’Flahertys were two of the highly influential families. Each had their tower houses, island fortresses and look out positions in this area. Most famous of the sea faring families must be the O’Malleys who were centred in a costal position from Bunowen Castle in the south of Connemara to their Castle on Clare Island and including Rockfleet Castle in Clew Bay, a short journey north from our home port. As a figure plucked from the pages of our history, Grace O’Malley or Grainemhaoil must be the outstanding individual hell bent on maintaining her position here. She was by no means the starter of resistance or exploitation of her area, her father before her had built a great trading fleet together with a multi layered defence and highly effective offensive fleet to extract a share from trading vessels along this coast. As a young girl Grace travelled with him learning the ways of the seas, understanding the need for trade and thus travelling to some very distant foreign shores. Navigation, seamanship and above all earning her right to rule her extended family and followers were what shaped her early years. Her exploits as both a legendary beauty and as the unrivalled Pirate Queen, left her with many enemies, not least the Crown authorities of Elizabeth 1st. She was even brought as far as the executioners scaffold before being pardoned by her adversary in London. More astonishingly she sailed to London with her fleet and met with the Queen of England and her great adviser Sir Francis Walsingham. Clearly some understanding was hammered out between them as Grace was for the most part left alone to operate in her usual manner for some time after that. Most of her fortifications are still here to be seen and explored and there are many exhibitions to her extraordinary abilities and colourful history. Of our remaining Tudor and Stewart influences, out on the island of Inishbofin is the most recent of our historic fortifications built by Cromwell’s order as a barracks and fortified position in the hope of subjugating those Celtic families that had ruled the waves in these areas for centuries. A degree of success was established and an element of control engineered before these barracks fell into disuse and life reverted in one fashion or another to a more traditional manor of ‘modern’ behaviour.